Nothing like a quiet lunch al fresco in a cool, shady location on a warm, summery sort of March day. 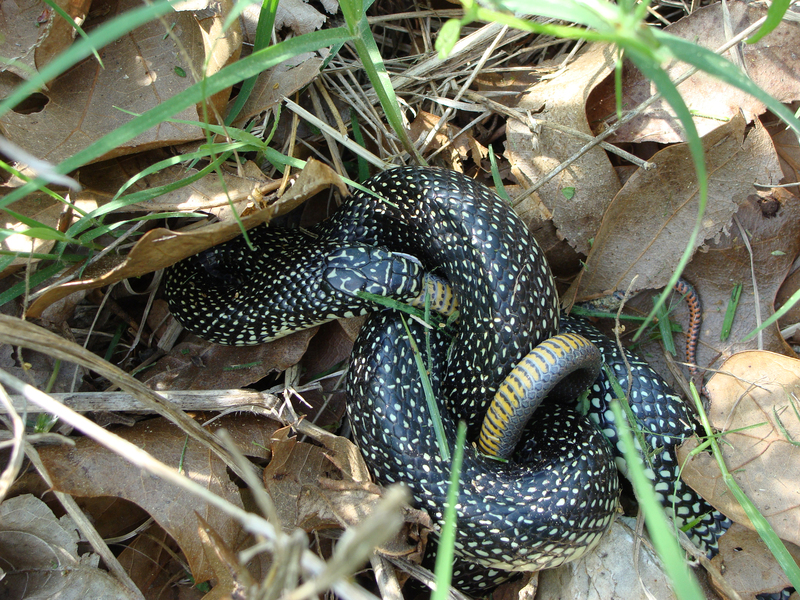 This young speckled kingsnake had such a lunch all arranged. 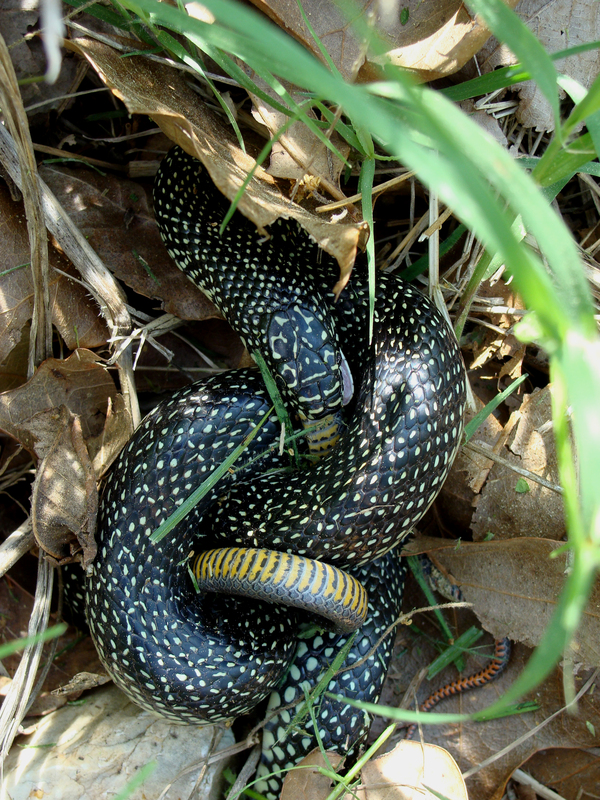 DEADLY ARRANGEMENT -- At least it was for the ring-necked snake that wound up as lunch for this specked kingsnake. ALL ARRANGED -- Speckled kingsnake arranges his loops around his prey, which he wound up eating as a human eats a strand of spaghetti. 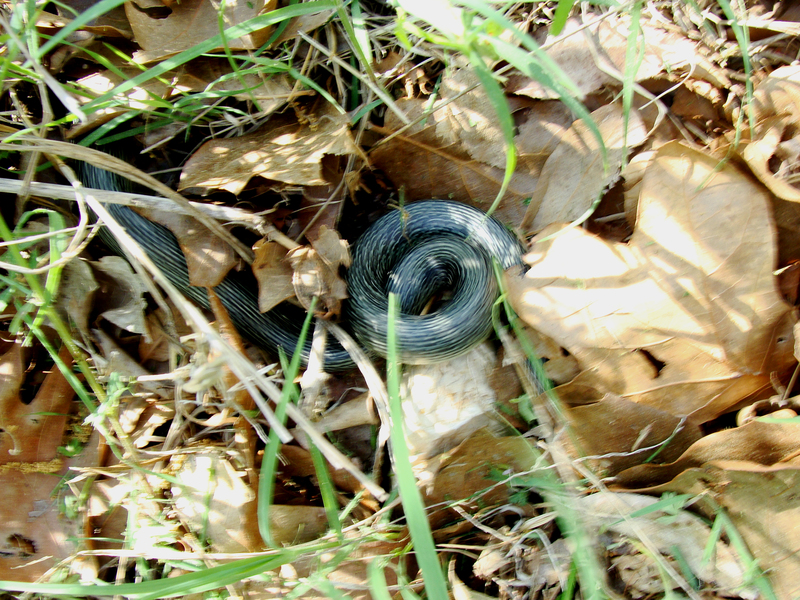 LEAVING THE SCENE -- Having finished lunch, the kingsnake spins away to a less public place amid the oak leaves and poke sallet. Here’s a somewhat lighter take on “arranged,” featuring an animal and food, from an earlier posting. Check out the other weekly photo challenge posts. 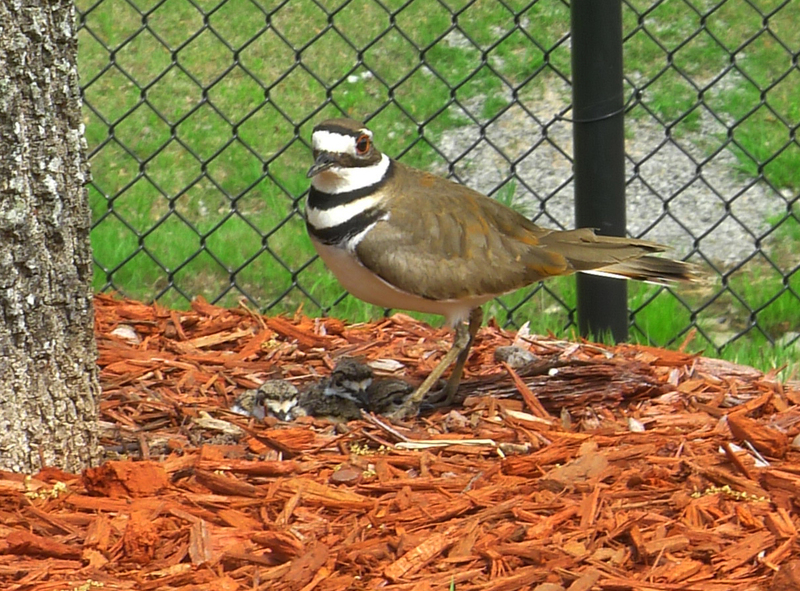 Killdeers are common on campus at the University of Arkansas-Little Rock and by nature are ground nesters. The local populations seem to be partial to nesting in what seem to be the most vulnerable places. This one chose to nest in mulch next to a parking lot curb. However, don’t under estimate the fierceness of mama birds. They can quickly become mama grizzlies if you get too close. 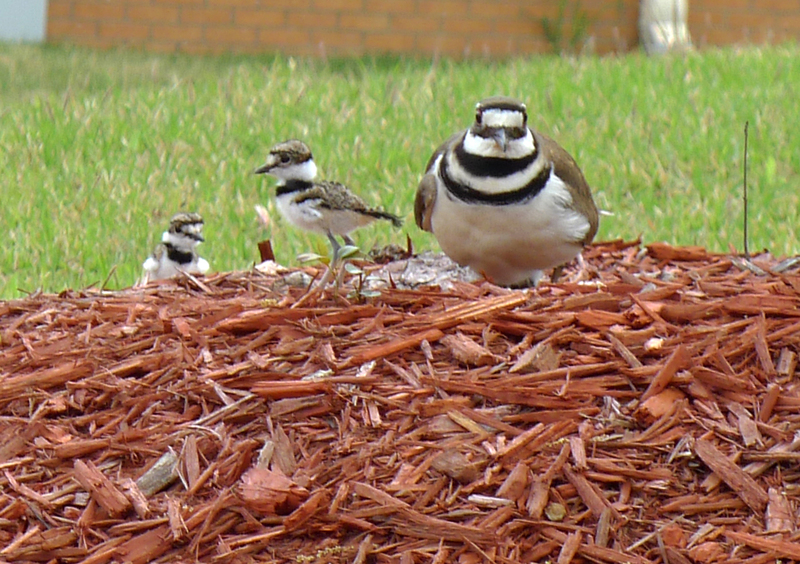 This killdeer mother was not afraid to protect her brood of three from the Friday Ride Day group that met just feet away. CHARGE! 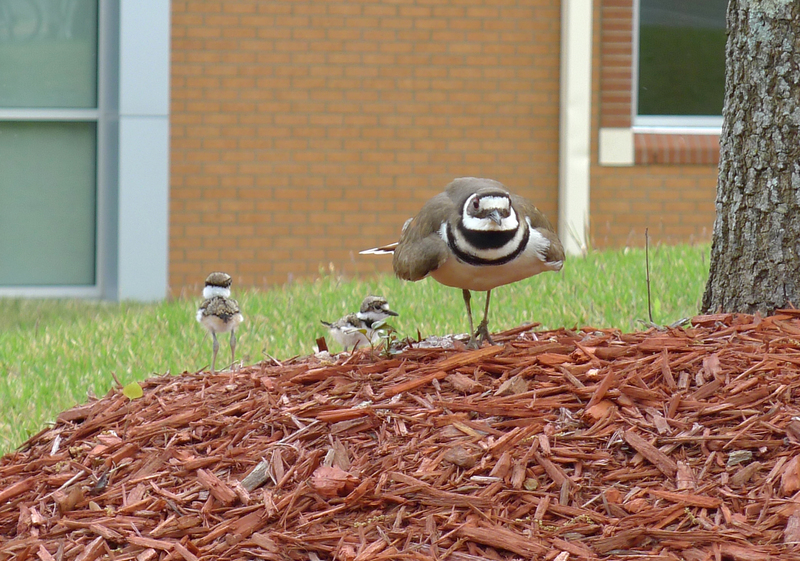 -- Killdeer lurches toward the photographer who ventured too close to her fuzzy little chicks. THREE IN THE HOLE -- The heads of mama's three chicks are barely visible in her shadow. BRAVE ONES -- Two of the chicks explore their world. 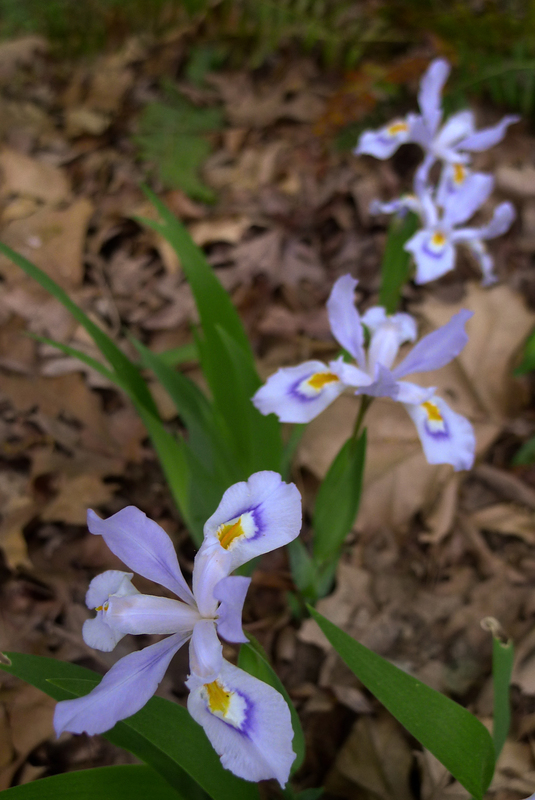 Spring weather has come early to Arkansas this year, bringing everything along with it, including the annual crested iris outburst. In 2010 and 2011, these beauties came along around the second week of April. This year, their ethereal lavender-blue standards and falls graced our woods before the end of March. 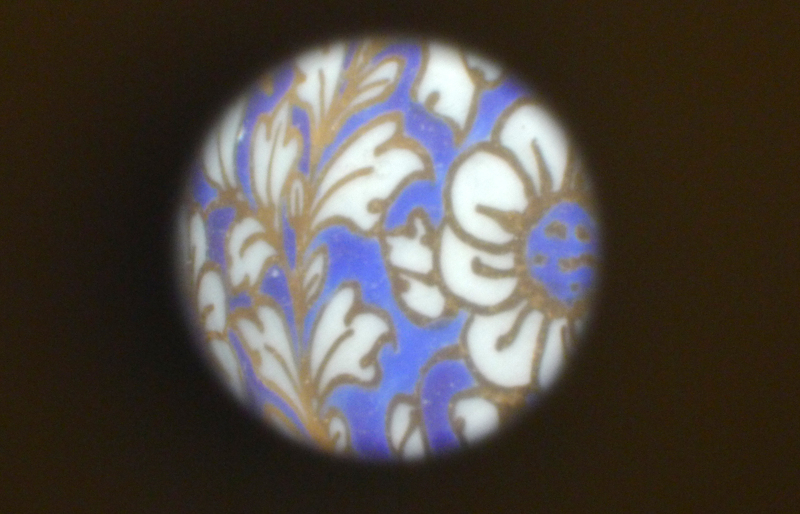 In years past, the irises seemed to prefer to be alone or in pairs. This year, there are crowds in the leaf litter. Some are live on the sheer edge of the road cut, while others seem to cling to the crumbling shale by their fingerling rhizomes. FOURTEEN'S A CROWD -- A group of crested iris, native to the Ouachitas, lights up the roadside. 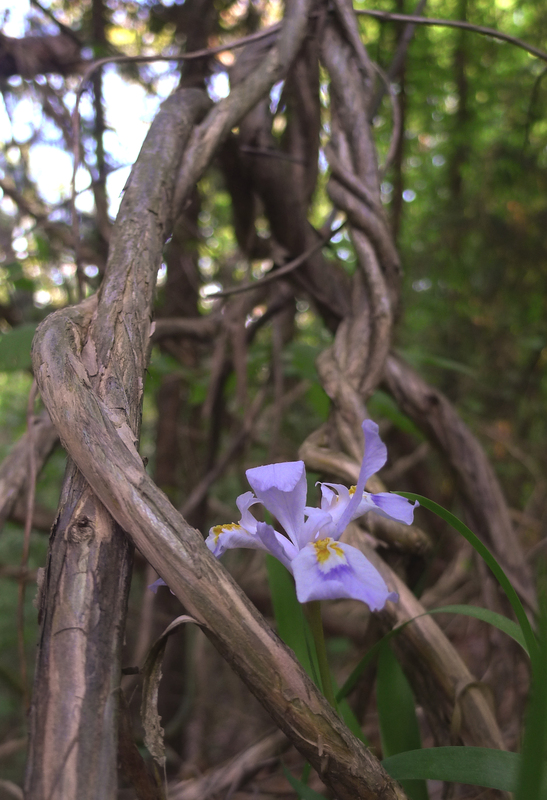 SOLITARY -- A single iris framed by vines on the Ouachita forest floor around the 600-foot mark on the mountain. 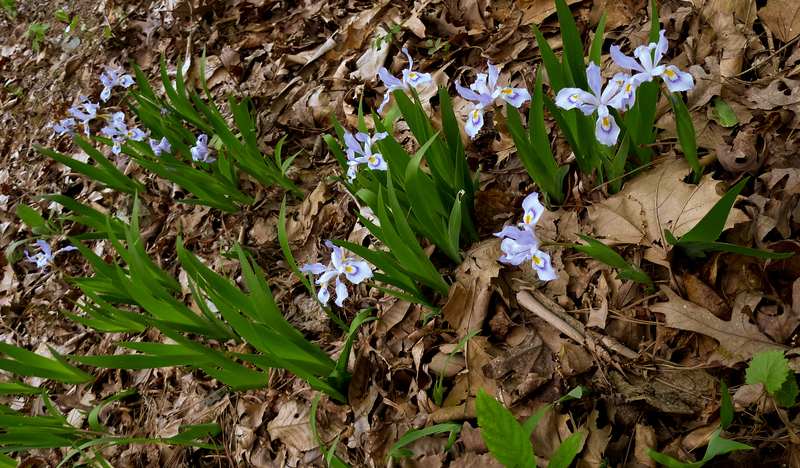 IN LINE -- A line of irises in the leaf litter. Passover is coming. Growing up outside New York City in a town where most everyone was Catholic (Irish or Italian) or Jewish, the coming of Holy Week also meant the coming of Passover. We all had a week off school to mark the holidays. We all had just enough Sunday school or Hebrew school to make our parents happy. Not theologians by any stretch of the imagination, but we had a pretty good idea of the basics and what went on in each church or synagogue. But even if you’re not immersed in the movement of the liturgical seasons, popular culture, particularly commercial retail, throws some pretty good clues. Hard to miss the chocolate bunnies, pastel Peeps, egg coloring kits and brightly colored baskets that signal Easter. In Arkansas,it seems finding evidence of Passover is a little tougher. Most years, the major tip off can be found in a tiny corner of the “international foods” section. It’s that empty space in the shelf where the matzos were. As the church marked the fifth and final Sunday of Lent 2012, couldn’t help but meditate on the image borne in the glass and lead of one of the north windows, a large Star of David. An odd thing in a Catholic church? As Christians come to celebrate salvation, it’s a good reminder of where it all began. 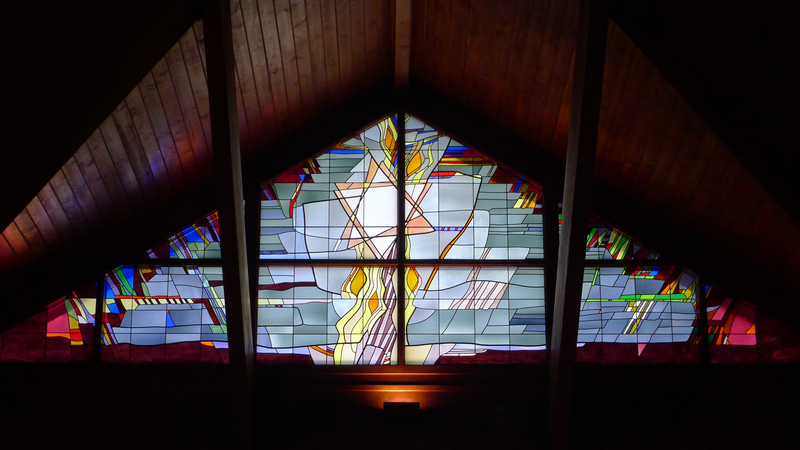 STAR OF DAVID -- This north window at our Lady of the Holy Souls Church is a reminder of the Judaic roots of Christianity. 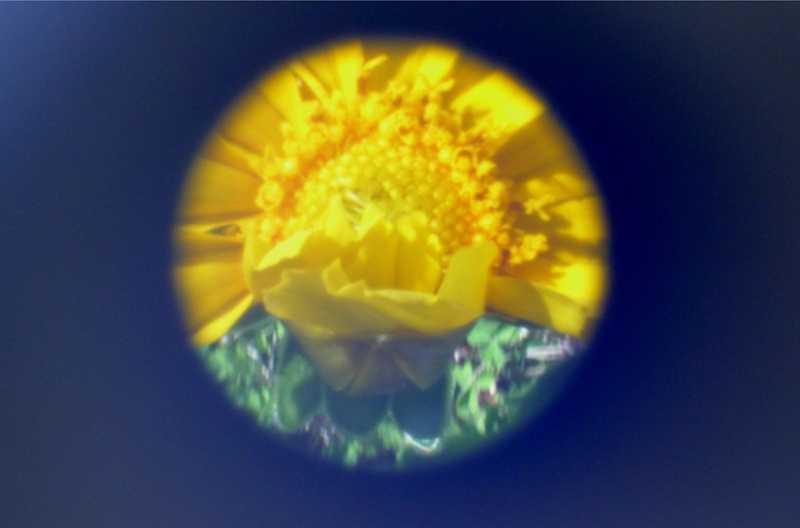 Pinhole photography has always fascinated us. With the passing of film*, we wondered whether it could be done mechanically using a digital camera rather than using the software version that’s available on some cameras. 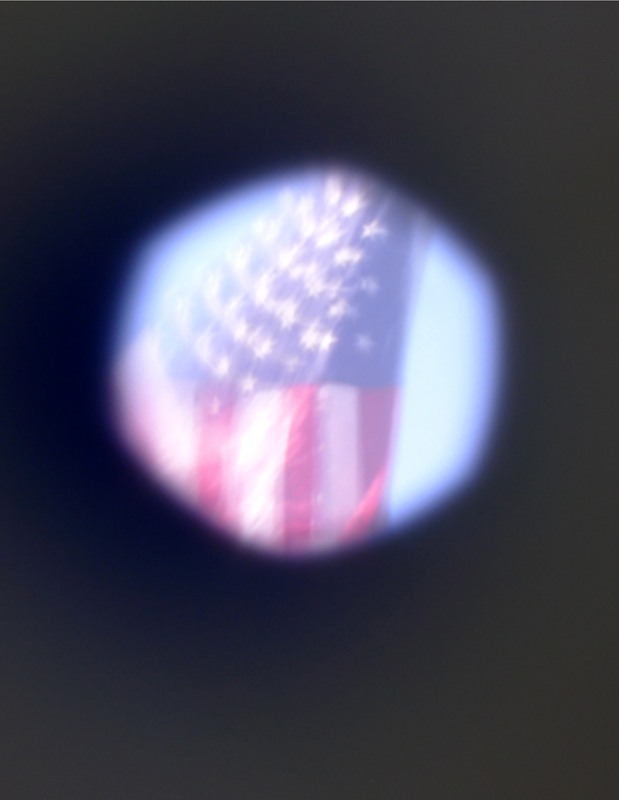 After a little experimentation with shutter and aperture settings, a black piece of cardboard with pinhole in it, and a little (cringe) tape, we think we got it working, or some reasonable approximation, with no digital monkeying. *We don’t really believe film is dead. Just taking a little nap. STARS AND STRIPES -- Our wind-blown porch flag. EARLY BLOOMER --A half-unfurled coreopsis flower greets Saturday's sunlight. 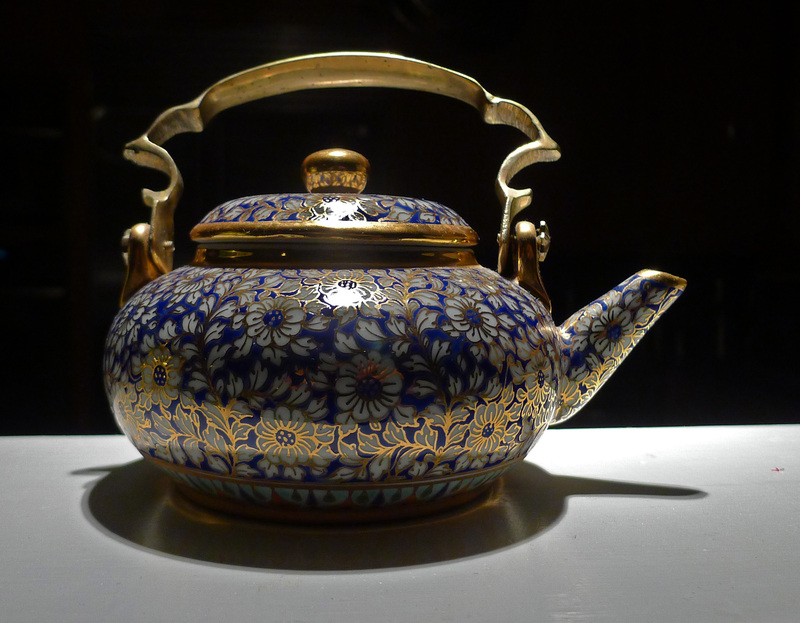 TEAPOT -- A closeup of a teapot made in my aunt's ceramics shop in Bangkok. A beloved memento of a trip there more than a decade ago. LITTLE TEAPOT -- Several visitors to The Interface have asked about the teapot mentioned above. Sorry, not a great shot, wanted to get this up ASAP. It's small, holding about two cups'worth, but was made with loving hands. 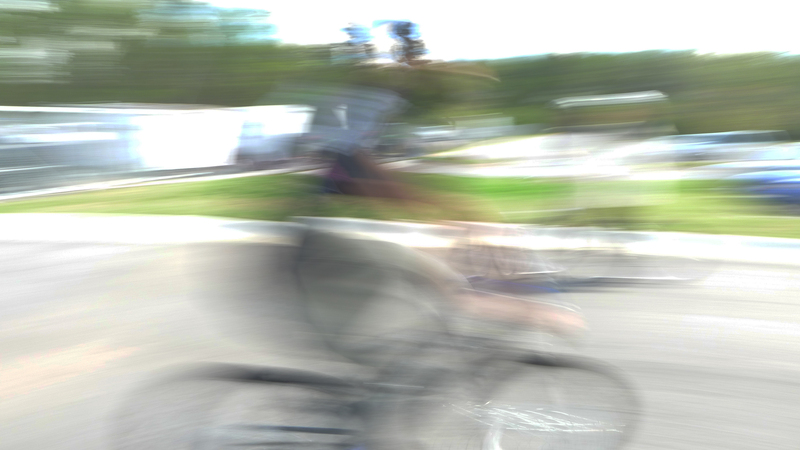 A bicycle rider is a blur as she moves through time and space relative to the camera’s eye. FRIDAY RIDE DAY -- A rider sets out on a sunny Friday as part of a workplace effort to get people exercising at the University of Arkansas's Cooperative Extension Service state headquarters in Little Rock. The rides are held at lunchtime and will run eight weeks, culminating with the city's Ride to Work Day. An ichneumon wasp? Whatever it is, it’s a beautiful contrast to the grass that’s greening up with the arrival of spring. 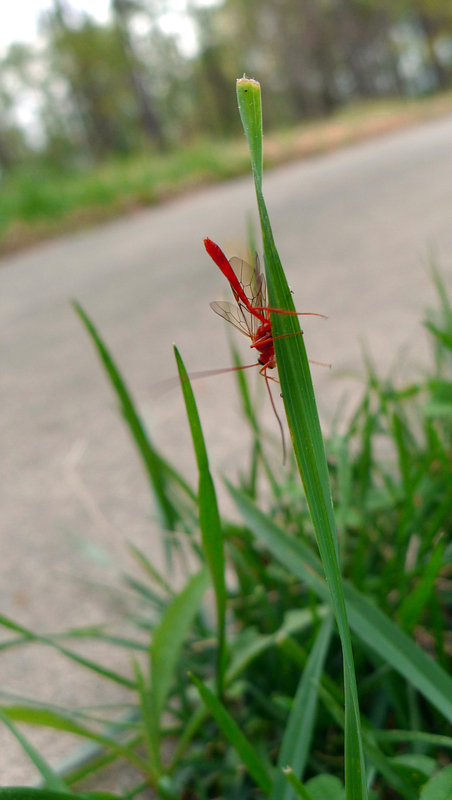 RED -- This stunningly red wasp certainly stood out among blades of crabgrass. A beautiful Sunday with highs in the 80s and bright overcast. Perfect day to take the hard top off the roadster and enjoy a, well, Sunday drive. Today’s road trip took us to Caddo Valley, Arkadelphia, Mountain Pine, the Ouachita National Forest and Hot Springs. It was a great time to try out the new compact digital, a Panasonic Lumix DMC-LX5, a replacement for the well-loved, but flash-dead Sony. 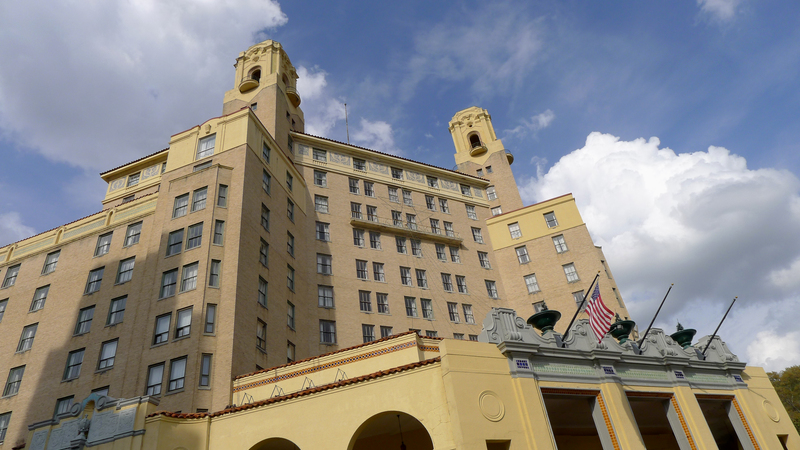 CAPONE SLEPT HERE -- The Arlington Hotel has played host to the famous and the infamous, including Babe Ruth, Harry S Truman and gangster Al Capone. 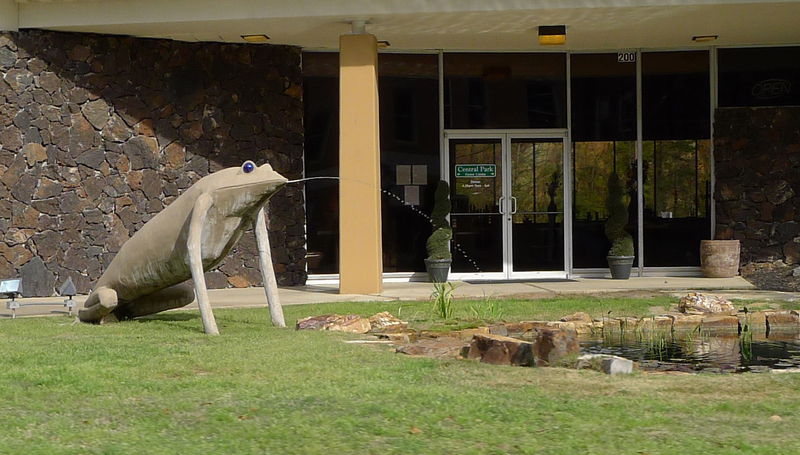 SPITTING IMAGE -- Oddly endearing frog fountain spits into a nearby pond at Central Park Fusion Cuisine, Hot Springs. BATH HOUSE -- The Fordyce Bath House was among the beautiful buildings restored along Hot Springs' Central Avenue. 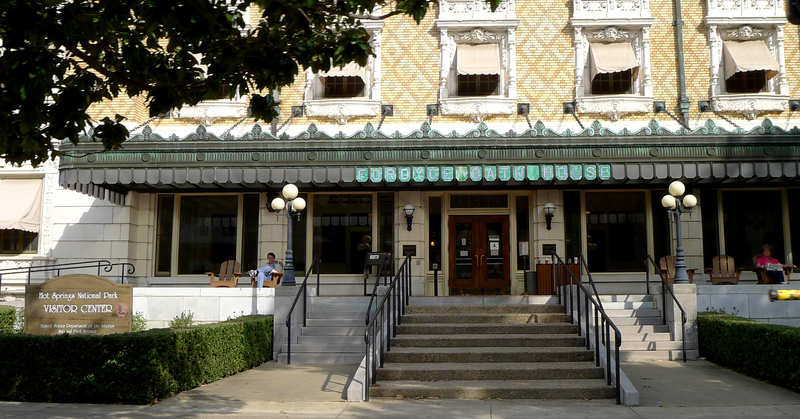 It serves as the visitors center for Hot Springs National Park. Hot Springs was known for centuries for its the waters that are said to have healing powers. 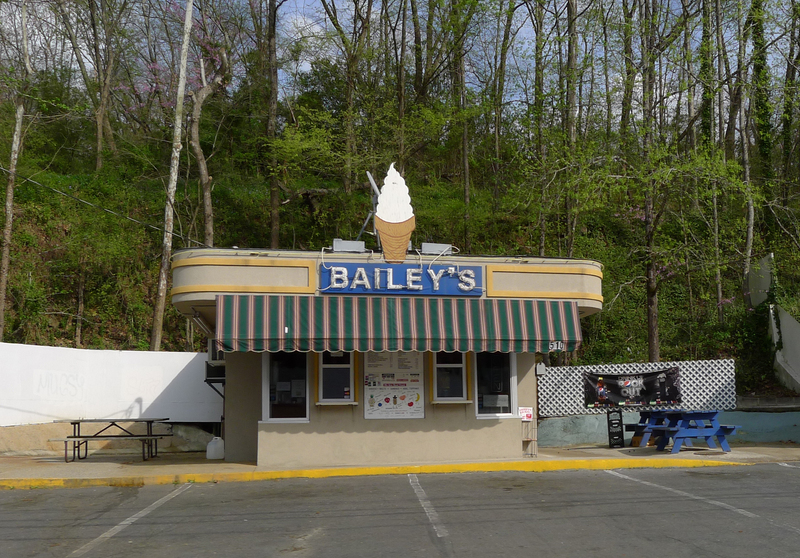 CONE --Bailey's Dairy Treat on Park Avenue in Hot Springs. 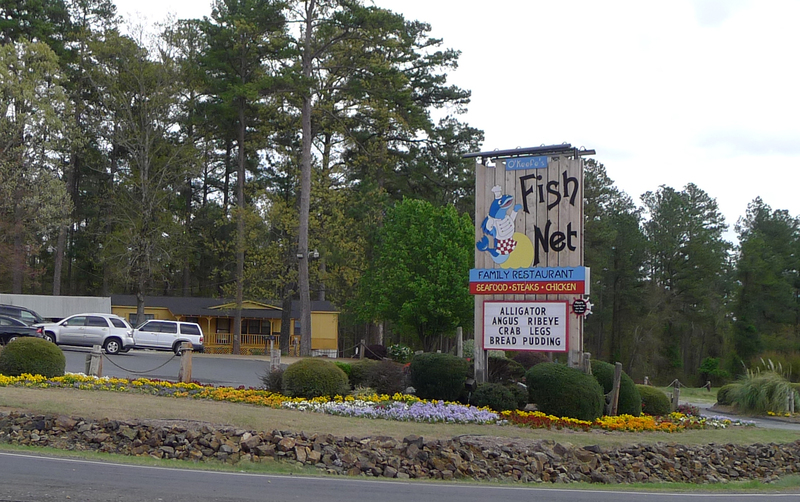 THE FISH NET -- Catches everything: gator, steak, catfish, fried green tomatoes and fried bread pudding. Deee-lish. Heading south and east on U.S. 165 toward Stuttgart (the rice and ducks capital), the western Delta was shrouded in mist as the Arkansas River shed vapor into the cool air, as did the ditches and dikes of the fields soon to be planted in rice, soybeans, cotton and milo. AVALON -- The tree-topped hummock appeared as an island in a field awaiting its seed near England, Ark. 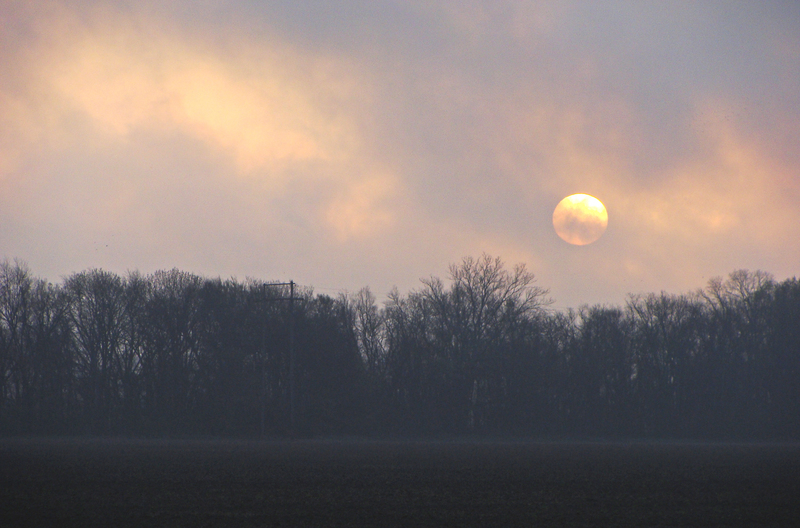 DELTA SUNRISE -- Sol peers through the vapors let by the warm Arkansas River somewhere near England, Ark. How hot was that coffee? Could’ve been a good prank, these web-footed spoons. HUH? 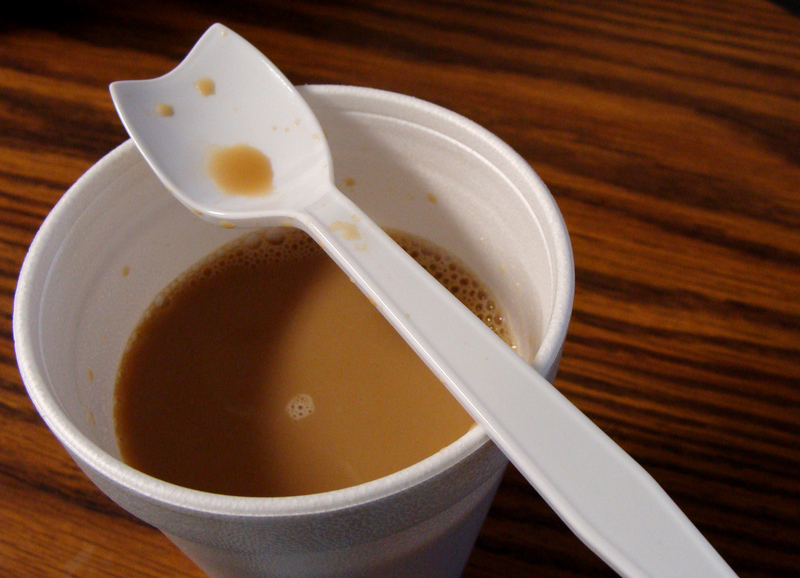 -- The end-eaten spoon was a manufacturing defect, not a reflection on the strength or temperature of the office coffee.